from 25mm to 250mm. They are available in Brown Aluminium Oxide. Used in Centreless grinding as control wheels . Most wheels are with straight and recessed sides with diameter ranging from 50mm to 400mm and thickness from 25mm to 250mm . We are providing the wide range of products for their client as per the client's requirement. Grindwell Norton offers a superior range of regulating feed wheels to match its MIKRON - Super Edge, Super Grinding - Centreless range. Regulating wheels are available in both, the more popular rubber bonded variety as well as in resinoid bond. Specially made for Center-less grinding so as not to compromise the finishing degree obtained with the wheel. These regulating wheels are very hard and wear resistant even through exercising an excellent driving action. Used in centreless grinding as control wheels. Most wheels are with straight and recessed sides with diameters ranging from 50mm to 400mm and thickness from 25mm to 250mm. Regulating Wheel, which not only drives work piece to run, but also can control in feed & crossing speed during machine operation. We bring forth different types of Regulating Wheels that are appreciated for superior edge, optimum grinding and center-less structure. These wheels are provided by us in both rubber bonded variety, as well as in resinoid bond. Our quality controllers stringently test these to ensure their performance and quality before delivering to the clients. grindwell norton offers a superior range of regulating feed wheels to match its mirkon - super edge, super grinding - centreless range. 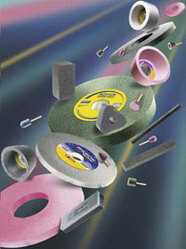 Regulating wheels are available in both, the more popular rubber bonded variety as well as in resinoid bond.